• Bleu – Done on a very hot grill for one minute on each side. • Saignant – Meaning bloody. Very rare, but cooked slightly longer on the second side than a bleu steak. • À point – rare for British or American standards. This implies that a steak is cooked a little longer than a saignant one. • Bien cuit – ‘well cooked’. This level will still often have some pinkness in the middle of the meat. 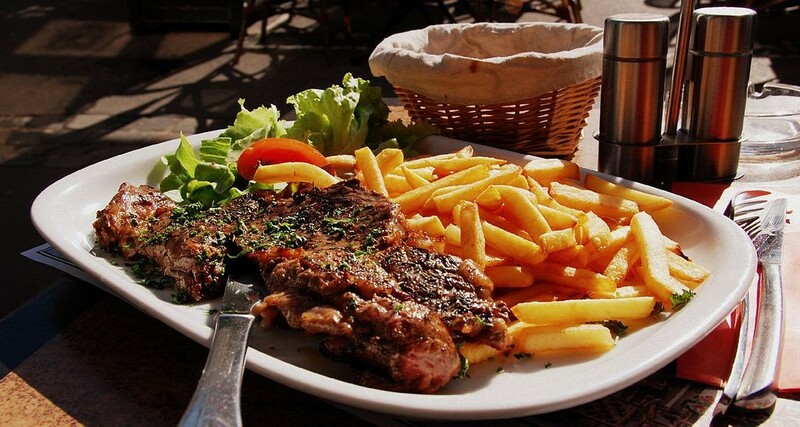 A ‘steak bien cuit’ is cooked until the juices run brown on the surface of the steak. • Très bien cuit (!) – should get you a steak that is totally cooked through! Thanks to Rachel and Grégoire Charles for their help with these definitions. The couple run Papillon, a busy restaurant in St Fraimbault in the Orne, Normandy, and Grégoire has 25 years experience as a chef in the UK and France. Rachel explains that foreigners needn’t be intimidated by the terms, and she would “…advise people to talk to the waiter/manager and explain whether they like their meat bloody, cooked through etc”. It is worth a couple of minutes’ chat in order to get your steak exactly how you like it.